High school facility is ailing due to years of deferred maintenance. 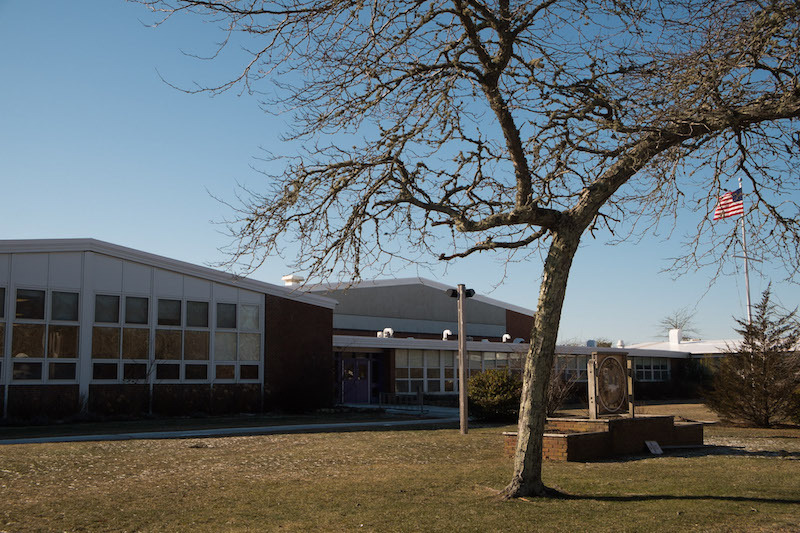 Renovations to the ailing physical facility at the Martha’s Vineyard Regional High School must be tackled as a priority — with or without the help of state funding. That was the message to the high school district committee last week from Vineyard schools superintendent Matthew D’Andrea. At a meeting Thursday in the culinary arts dining room at the high school, Mr. D’Andrea urged the committee to get going on the building project, which has been deferred for years. The last time the high school saw a significant upgrade was 20 years ago. “We really need to start moving forward. We’re spending money every year to keep this building going. However, a building project is on the horizon, and a lot of us feel strongly that it’s time to address that,” the superintendent said. Immediate repairs needed at the high school include heating and air conditioning systems, building envelope, vocational facilities such as the horticulture program’s greenhouse, and renovation of the track which is failed and cannot be used by athletes. The high school has applied for entry into the Massachusetts School Building Authority program for three years in a row, with no success. The MSBA program provides both planning and financial assistance for qualifying school projects. The Tisbury School was accepted into the program two years ago and is now more than midway through plans for a new elementary school. The high school will apply for funds from the MSBA again this year, but Mr. D’Andrea and committee members agreed that even if the school is not accepted into the program, waiting is no longer an option. Two years ago the school hired Tappé architects to draft alternatives for the project. “We’d like to . . . start looking at that preferred option again and some of the other options that we had looked at with Tappé with the idea of possibly moving forward with a building project on our own,” Mr. D’Andrea told the committee. There are no final cost estimates, but renovating the school is expected to cost millions. A study done in 2015 found that some $10 million worth of repairs were needed in the short term. Since then, some money has been spent, mostly on emergency or stopgap repairs. Looking ahead, last week committee member and board chairman Kris O’Brien raised the possibility of creating a 501c3 to help defray some of the cost. Meanwhile, a facilities subcommittee charged with looking at existing designs for the building project, will prioritize completion of the track and greenhouse projects during this school year. In other business, the committee voted to appoint a subcommittee to examine and clarify the regional high school district agreement, which dates to the late 1950s. Among other things, the agreement includes a formula for town assessments to cover the annual high school budget. The meeting began with a moment of silence for Jake Baird, the high school student killed in a car accident on Jan. 12. The next high school committee meeting will take place Feb. 5. Very good reporting Holly ! Rather succinct !! Always the last thing to take care of is the building first thing and always fist are the teachers. It maybe time to think about cutting down the size of the building to save costs as well. School population trends have not gone the way they thought 25 years ago in fact have gone down. Correct - in 2000 the number of HS students was roughly 800 and this year it is 650. That's a pretty big slide.